With an app to help burn calories. Or, with apologies to George Michael: “Last December you gave us your heart, and the very next day we made you do more pushups.” HA! Ah, we miss Mashups… But we digress. Back to our post about December’s BAMworkout. Remember #K2C? It stood for “Kind to the Core,” and was our first altruistic fitness workout in which we challenged everyone to give $1/day for each day they completed our core workout in December. It was a smashing success! In total, the girls of BAMstrength raised over $400 for the Leukaemia & Lymphoma Society and were able to drop 100 pushups, no problem, by the end of the month. That’s a LOT of sweaty bicep giving. This year, we’ve revamped our December challenge (#K2C2) and are asking you to go the extra mile and become a sponsored athlete. Yes, you heard that right. We’re challenging each of you to become a sponsored athlete for the month. And, with our challenge starting on December 1st, the same day as #GivingTuesday, we encourage each of you to persuade others to join in on the fun as well. How do you go about becoming a BAMathlete? It’s easy. Simply go your app store and download Charity Miles on your smartphone. You’ll be asked to log in, and then each time you plan to walk, run, or ride a bike, you open the app, choose a charity, and press start. As you exercise, the app tracks your distance, and a corporate sponsor donates money to your charity on your behalf! At the end of the month you can choose to finish your sponsorship, at which time they will send you a note confirming your hard work and total amount you earned. Really, this couldn’t be better. You win from exercise that is motivated by giving to others, and charities win via donations. You could, of course, plan to match a donation on your own – that is entirely up to you! With 37 charities to choose from, we hope you can find one that you’d like to support! If not, then we challenge you to keep track of your own distance the month of December and make a charitable donation to the charity of your choice. We would like to be able to keep a running tab on how much you badass ladies are giving, so keep us updated through the month (using the hastag #K2C2). Wouldn’t it be great if we could smash last year’s total in charitable giving?! Who: BAMs, BAM husbands, wives, BITs, bf’s, gf’s, and BFFs, and any other BAM-type peeps! What: Two days of #BAMily fitness and fun in the sun. Why: Why not? OK, better answer: Ruth and her BFF Belinda are going to Maui at the end of April 2016. A few BAMs expressed interest in combining a vacation with an epic BAMily meetup, and jokingly tossed around the idea of putting together a BAM event and inviting any and all BAMs to join. Before long, the idea became reality! Cost: $50 US (Covers BBQ on final day, welcome pack, and prizes), but sadly, airfare and hotel are all yours. Sunday evening: Optional welcome dinner at a local restaurant to meet everyone, get your welcome packet, and ask questions. Evening yoga and/or meditation at sunset. Sign up by March 1, 2016. If you sign up by December 31, 2015 you will receive a leather BAMStrength bracelet! Participants will be required to sign a waiver upon arrival. Participants need to arrange their own flights, hotels, and transportation. Participants are responsible for their own food, water, and snacks except for the BBQ on the last day. Are these “fitness days” going to be hard? First and foremost, they’re going to be fun. A hoot, really. We have some real nonsense planned. And really, it’s mostly about getting together with the #BAMily. Kihei is on the west coast of Maui, smack in the middle. It is in a terrific spot as it one of the driest places on the island – if it rains, it’s only for a few minutes. What is the time difference in Kihei? Maui is 6 hours behind Eastern time. What is the weather like on Maui in April? From Frommers.com: The off season, when the best rates are available and the islands are less crowded, is spring (mid-Apr to mid-June) and fall (Sept to mid-Dec) — a paradox because these are the best seasons to be in Hawaii, in terms of reliably great weather. It’s the beginning of the dry season, with temps in the mid 80s (29 Celsius), and less than an inch of rain (2.5cm). 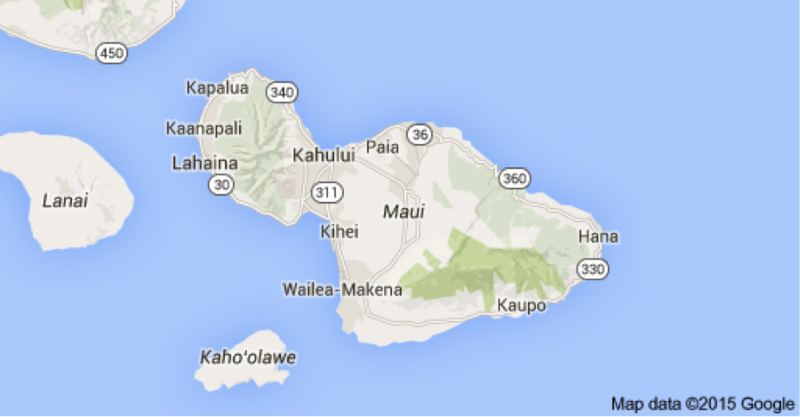 How far is Kihei from the airport? Approximately 30 minutes by car. It depends where your hotel will be. If you are right in Kihei you can walk to the grocery store, the beach, and many restaurants. If you want to visit other areas on the island you will want a car. There are relatively inexpensive local rental car companies that will rent you a car that’s not shiny and new, but that’s perfectly reliable. And cheaper. Just ask if you want info. Note: if you decide to do the Road to Hana drive, make sure you get a gently used vehicle as your car will be beat up by rough roads along the way and you don’t want to be charged for nature’s unintentional dings. There are many condos and hotels in Kihei and Wailea at a number of different price points. Just ask if you want some suggestions or ideas. Are there other BAMs I can share a room with? Pretty sure there are. Just ask! Most important? Sun screen, bathing suit, hat, and sun glasses. And enthusiasm! Many condo rentals supply beach towels, snorkels, flippers, boogie boards, beach chairs, and beach towels. You can also rent these things locally. For BAMapalooza you need a bathing suit, shirt and shorts, flip flops, and running shoes. Maui is VERY casual. You do not need fancy clothes, but if you like to dress up for dinner you most certainly can! What are some other things I can do while in Maui? Can you believe it? 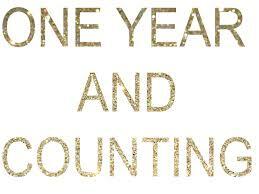 BAMstrength is a year old this month! It was fall 2014 when The First Ladies found each other on Twitter. 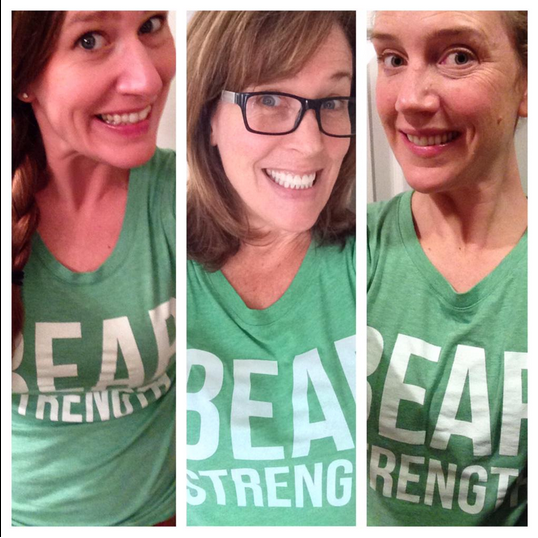 For those of you who know BAM’s history, you know that we started tweeting via our pals at The Bear Strength Clothing Company, and soon realized we had a shared goal of getting back to fitness. In November of 2014 we did our first challenge, 30 Days of Strength, and had a few #OriginalBAMs join us. 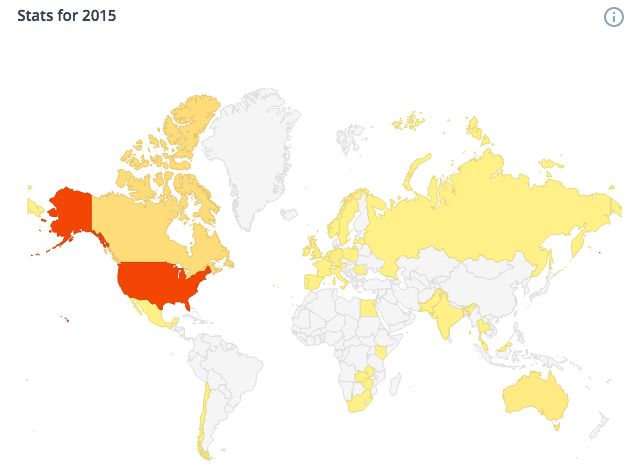 We also started this blog in November, with Sarah starting things off with You Found Us! on the 25th. We’ve come so far since then. Twelve 30-day workouts, more than 550 followers on Twitter, a Facebook page, charitable donations in support of Ben Towne Foundation and Bloodwise (formerly Leukemia & Lymphoma Research), BAMily meetups around the globe, BAMstrength bracelets, BAMbuddies chatting and supporting each other via texts and abundant use of cookie, chocolate bar, and pineapples emojis. 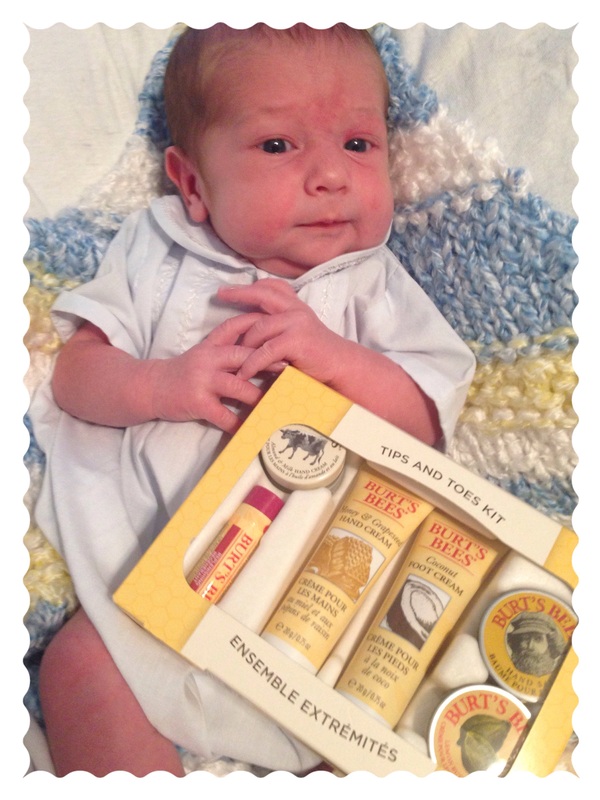 And who could forget Gabriel, our first official BAMbino? Where we will be this time next year? When we quietly dream about the future of BAM, we see more active, engaged members, more original challenges written just for us (like Kim’s BAMingSexyBack this April), and more blog posts to keep us connected and inspired. As we being to meet more of the BAMily offline, we have all noticed that it feels a lot like meeting an old friend for the the first time. It is weird and wonderful and we hope to foster more of these opportunities. We are looking forward to tracking the badass exploits of our group through the Traveling BAM Flag and hope to see many of you at BAMapalooza 2016 in Maui in April 24-26 (details coming #soon), or at one of the BAMily meetups this year. We know so many of you are working on your own fitness and health goals, and we believe you will achieve great success next year with the support of your BAMily and your own badass heart and soul! For this month we are revisiting the very first challenge we did together: Thirty Days of Strength at Darebee.com. Click here for the link. Don’t be afraid of the moves if you’re new to this kind of exercise. Everything can be modified and you can choose your level. In fact, we encourage you to compete the Fitness Test first to see what level you’re at. 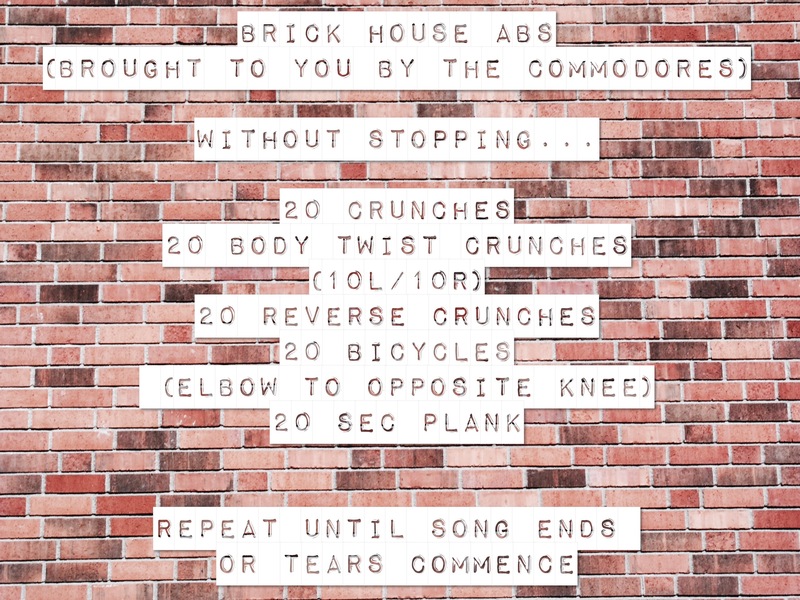 Give it a shot, and as always, let us know how you’re doing, whether it’s the #BAMiversary workout or #DoingYourOwnThang. The Traveling #BAMflag. What’s that, you ask? Read on. 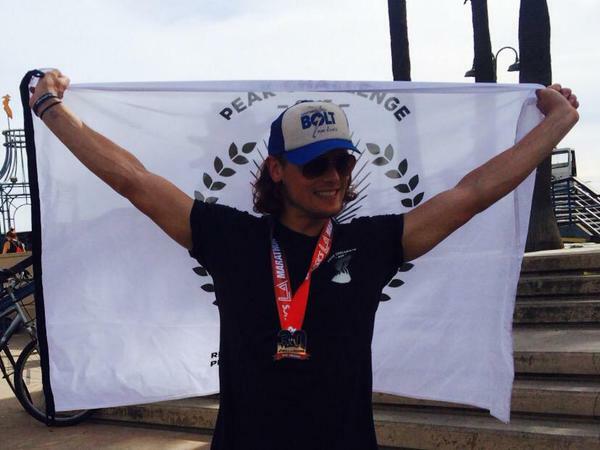 You may recall that last spring during My Peak Challenge, the folks at Bear Strength and Fight Camp carried a flag to the top of a snowy peak in Wales, and actor Sam Heughan wore one like a majestic poly-blend cloak as he completed the LA Marathon. One of the flags was auctioned off and Linda was drawn as the winner of the other one. Well, that flag is about to continue its travels as we launch the Traveling #BAMflag. 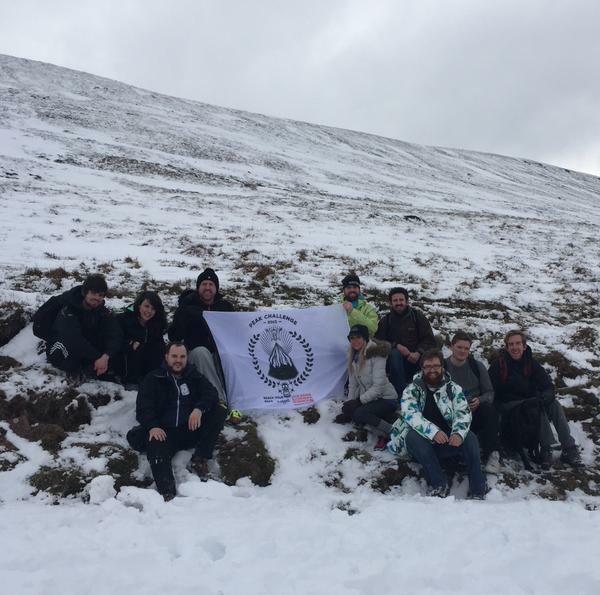 One of the ways we’d like to support MPC2 is by sending their flag all over the world, accompanied by BAMs who are engaging in some kind of fitness activity or challenge. Linda kicked off our program by having a baby and signing the flag with BAMbino Gabriel’s footprint and her own name. 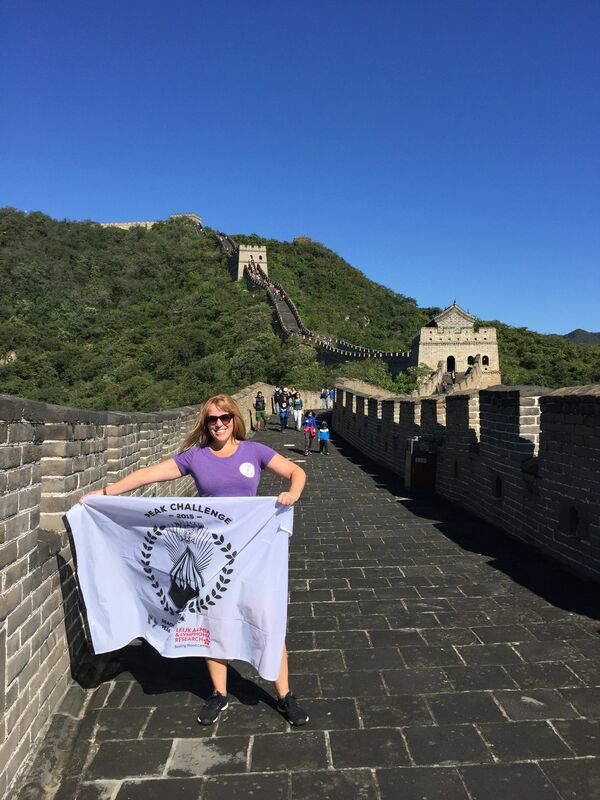 Next she sent it to Ruth, who carried the flag along the Great Wall of China as she completed her epic trip and logged over 175km walking in 10 days. Ruth will sign the flag too, and then send it on to someone else. So how can you get involved? You don’t have to have a baby or go to China. (Though, if you REALLY want to, go for it!) 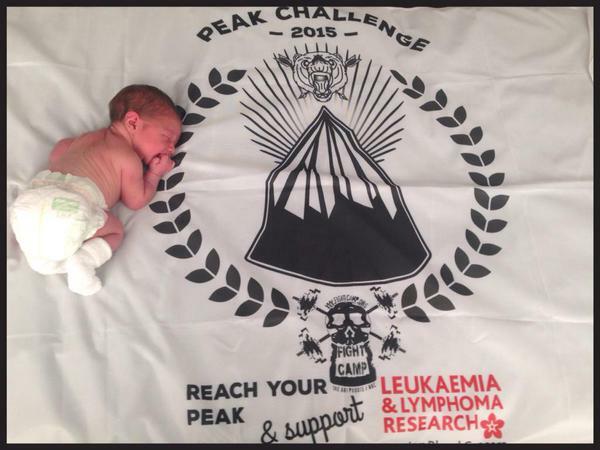 Whether it’s climbing a mountain, doing a 10K, or walking a couple of miles in your own city for the first time, we would like to capture your fitness challenge moment with this flag and share it with the world. All you have to do it let us know when (and why) you’d like the flag, and we’ll start coordinating the logistics. Then you have to promise to send us a pic, write an entry in the journal that will accompany it, and send it along to the next BAM! Can you imagine the photos? We imagine this to be a HUGE way to support and build awareness for MPC2, but also to support our growing BAMily of badasses. As the BAM flag makes its way around the world, we are hoping to build more opportunities for meet ups, BAM cheering sections, and maybe even BAMs who start training together for events. One last thing. If you do so desire, we encourage each of you to make a donation to the badass charity of your choice upon completion of your fitness challenge. If you participated in the first My Peak Challenge, you’ll remember that donations were given to the charity Sam Heughan supports, Bloodwise UK. We simply ask that you make mention of any donation made, noting it in your journal entry, so we can tally results at the end of the Traveling #BAMflag. Send us a private message via Twitter or Facebook if you’re interested. We can’t wait to see what you all come up with! It’s October in BAMelot, and we’re painting the town…orange. Pumpkin everything: pumpkin spice lattes (unless you are Sarah, who prefers her coffee unmolested by gourds), pumpkin bread, pumpkin scones, pumpkin bagels, pumpkin patches, wee tiny babies in pumpkin costumes. Pumpkins everywhere. It only seemed only fitting that we bring the Pumpkin to the BAMily in as badass of a way as we could. We’re here to PUMP(kin) you up! The first part of our challenge is to GO OUT AND BUY A PUMPKIN. Don’t question us, just do it. We don’t care if it is from Safeway, or an heirloom Cinderella, or still covered in mud from the pumpkin patch. Just get yourself a cucurbita pepo. (Yes, we googled that.) You’re going to need it for the second part of the challenge we’ve put together this month which will incorporate a new medium–a daily photo challenge. If you haven’t done it yet, be sure to follow us on Instagram at BAMSTRENGTHGIRLS. We want you to post your pictures either on Instagram or Twitter, using your pumpkin in the photo, hashtagging it with #BAMstrength or #BAMstrengthgirls, lalong with our monthly hashatag of #PUMPkinUpTheBAMs. We will be keeping tabs on your progress, picking the baddest of the badasses to repost. 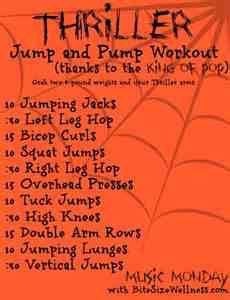 This leads us to the third part of #PUMPkinUpTheBAMs, which encompasses the fitness aspect of our October challenge. This month we’ve chosen to do something very different from the norm, compiling some of the best dance and one-song workouts from the internet that we could find (and a few of our own inventions) into one monthly fitness challenge. 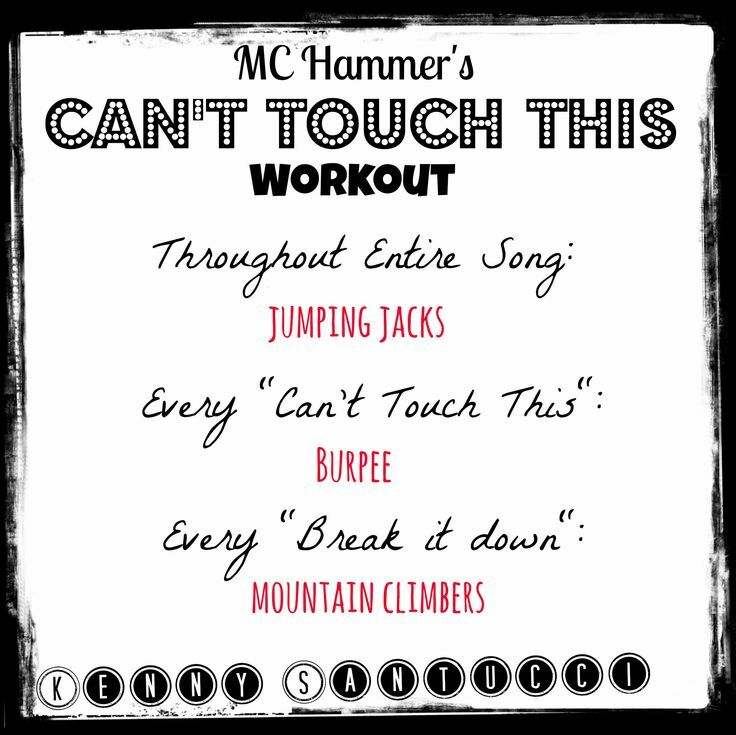 Add them to your daily WOD for an extra boost, use it as your way to fight the 3pm doldrums, do it with your kids during the dinner time witching hour–whatever your schedule, there is time for a one song workout! So bookmark this page and get ready to dance (and squat and burpee) your pumpkin off. We’re PUMP(kin)ED you’re here! OCTOBER 4: Do your own thing . . . and tell us about it of course! OCTOBER 8: Walk one mile (or more!) with your pumpkin, because we are here to Pump(kin) you up. Always and forever. 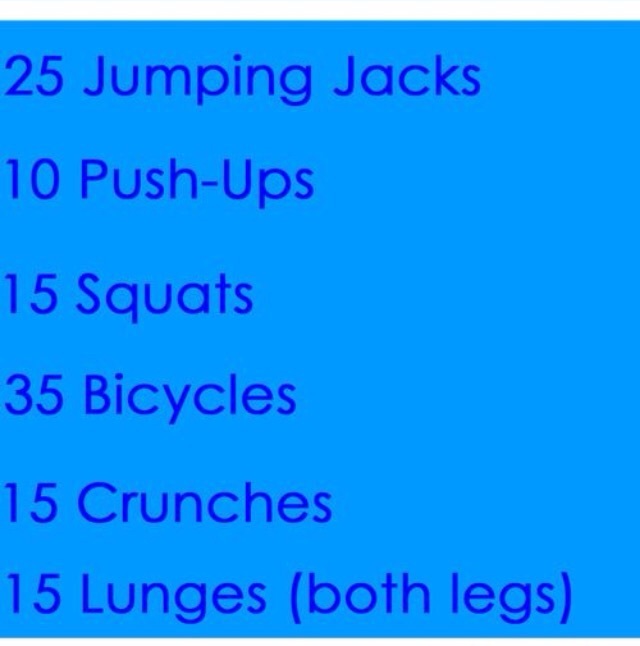 OCTOBER 12: “Call Me Maybe” Blogilates workout on YouTube. We seriously love this girl and consider her an honorary BAM member. OCTOBER 13: Walk one mile (or more!) with your pumpkin, because by now you are best friends. Just you and your kickass pet pumpkin. OCTOBER 15: “Whip Nae Nae” cardio workout on YouTube – do it with your kids! OCTOBER 17: Try combining a few of the workouts that you’ve already done. Don’t forget to tell us about it!! OCTOBER 19: Do your own thing! And share your adventures with the BAMily! 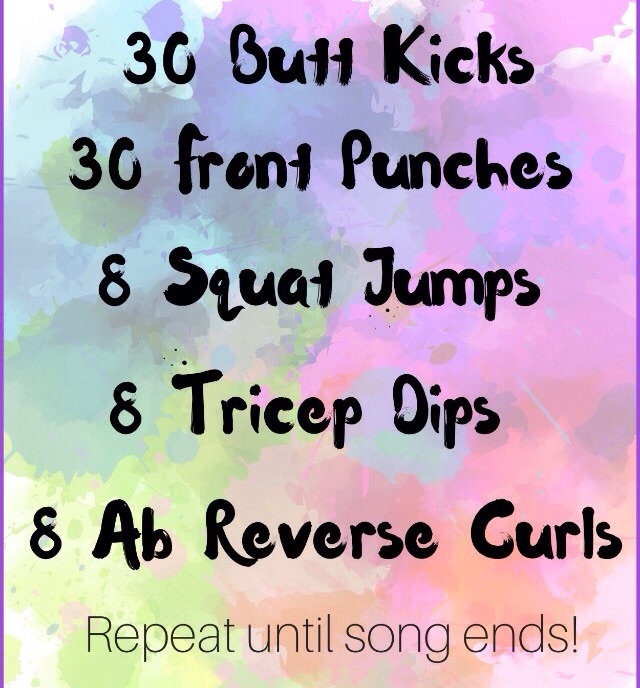 OCTOBER 23: “As Long As You Love Me” Love Handles workout with Blogilates on YouTube. We love this girl. OCTOBER 25: Walk one mile (or more!) with your pumpkin. OCTOBER 26: Do your own thing! Hashtag it #DoingMyOwnThing on Twitter. 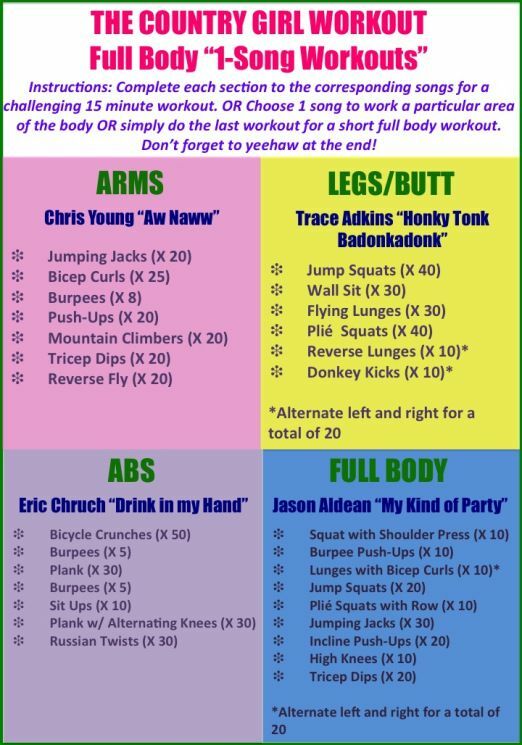 OCTOBER 28: Pick one of these, find a pair of cowboy boots, and saddle up for a workout. 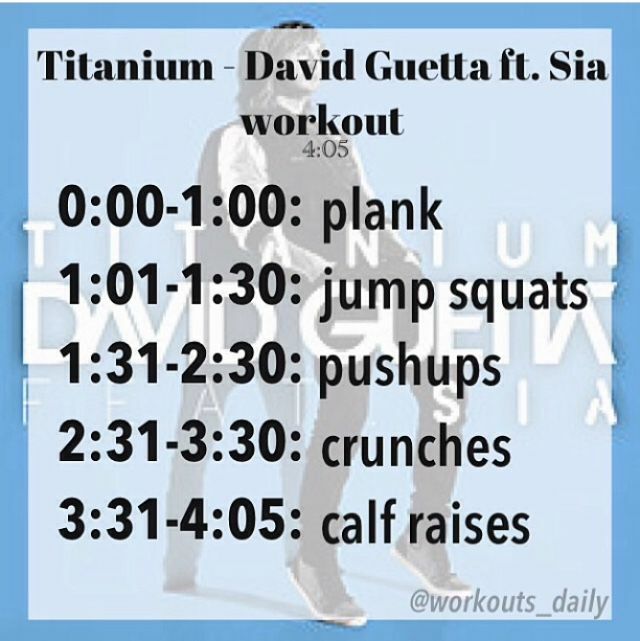 OCTOBER 29: Pick your own song and do this workout. For some people this is a time of sadness as we say farewell to summer and head back to work. In a recent Facebook post, BAM Shan (@bonoisagod) likened this time of year to “a Sunday…the last day of the weekend. The last day you get to sleep in. The last day before the long workweek begins again.” So many of us love summertime and that feeling of relaxation (lethargy?) and heat and sun and sand and popsicles. Labor Day can signify the end of those things, unless you’re BAM Karen (@kazcas23) who lives Down Under and is heading into spring. Or, you may think like Ruth and celebrate September as a New Year! A time to go back to all things normal and scheduled and routine. The return of football and apples and crisp days and sweaters and boots! If you are like Sarah, you get a little thrill walking past the aisles of notebook paper and binders and sharp Number Two pencils. This September for Linda will mean working her way back to a familiar fitness level now that our newest BAMbino has made his debut. Or, instead of “back” you may be happysad that your little one(s) are moving forward and heading to school for the first time. What a big step they are taking and you’re so proud and nervous for them, and a little teary as they say “bye Mom” and go running. Whatever it is you’re going back to or forward to, your BAMily is here to support you and challenge you to be the best you can be. If you are starting a fitness journey, going back to the journey that had a summer hiatus, or moving forward to a new fitness level, we’re with you! For us, this September is about getting Back to BAM. We ran challenges this summer and many of you jumped right in! We have loved your posts and pictures and all around enthusiasm, not to mention your support for others making the journey. Your fitness challenge is the Darebee (formerly Neila Ray) “30 Day HIIT Program.” HIIT = High Intensity Impact Training, and this particular program requires no special equipment. You can access the website by clicking here. Note there is a downloadable PDF, which is super helpful. We love these programs because there are many levels for you to choose from each day. Click here for their Fitness Test to help you figure out which level you should target. Your social element involves bringing a buddy to BAM. How many people can you get to join us? And we mean REALLY join us. This isn’t about increasing our follower number on Twitter. It’s about reaching more women who want to get fit and strong and laugh while they do it. For every follower you bring to BAM, (ie. the more you spread the buzz about BAM), you will get an entry into our contest for a most fantastic prize pack donated to BAM by Burts Bees! Sarah here behind the big blog switchboard. We’re super excited that it is August and the #PushIt Challenge is officially underway. We can’t wait to hear from all you badasses about how you are pushing your limits in August, whether with this workout or something else entirely. And of course, we cannot wait to meet Linda’s wee little lad when he makes his debut in a few short days! It’s shaping up to be quite a month of change and challenge. But we’ve got this, right? With the exception of Kim’s awesome #BAMingSexyBack challenge in April, which she designed for us, the challenges we have utilized until now are ones we have found online. Since this group started as a homegrown trio of girls just seeing if it was possible to do a long-distance fitness challenge together, we are learning with every challenge the best way to find and present workouts. As BAM grows, we hope to cultivate relationships with more trainers and grow our cache of workouts designed exclusively for us as well. In the meantime, however, we will continue utilizing challenges we are able to find for free online. (Like the ones we have used in the past for the superhero challenge from http://darebee.com and for #YoFlex from http://www.doyouyoga.com.) 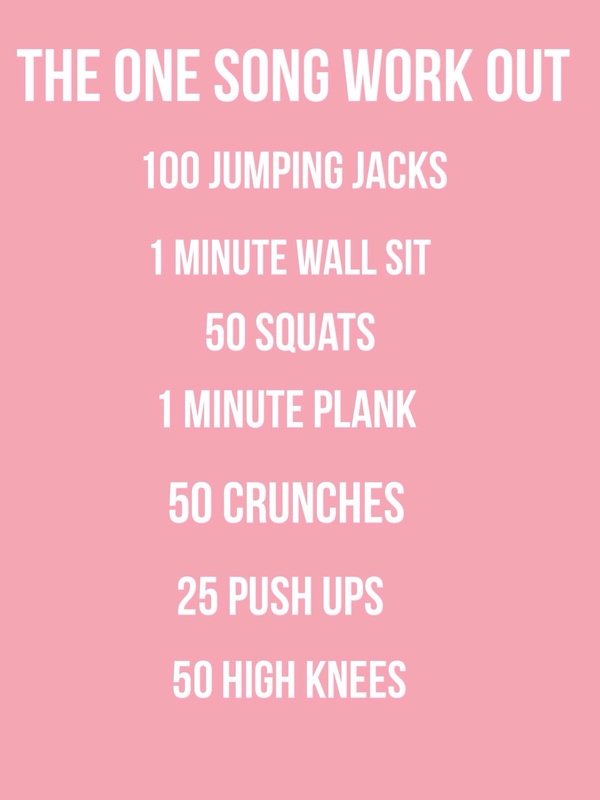 As long as the workouts are posted for free online and our major function is to encourage you and connect you with other women who are doing it too (and chat about it with enthusiastic emojis), this feels an equitable arrangement. Earlier this week, however, it was brought to our attention that our previous post did not state clearly enough that we did not design the workout we chose for August. This message rattled all of us because we are very committed to NOT taking credit for work we have not done, as individuals and in our work with BAMstrength. We operated under the assumption that following the embedded link would make the origins clear, but in retrospect that was the wrong call. We are genuinely sorry if our actions in any way gave the impression that we were trying to pass this workout off as our own creation. We should have been more explicit in our language so that anyone reading would have immediately understood. We have fixed that on the blog today and will be sure include more robust explanations in all future challenges. We would like to offer our sincerest apologies to the author of the challenge, Marc Hemingway, for our carelessness. He seems like a lovely guy and his blog includes the inspiring story of his transformation from “couch potato to runner bean.” Be sure to check it out: http://hemingwayrun.com If you like his challenge, I’m sure he’d also love a Twitter shout out too: @zepalm. Again, we apologize for our failure to be totally clear. We will do better next time. Thank you all for your believing in us and supporting the BAMily. Your enthusiasm and support are why we are all here. Now go #PushIt. And be sure to capitalize that I, or you’re going to get…um…it…all over Twitter. BAMs, August is staring us in the face. That month where we have the dog days of summer, the onset of back-to-school commercials, and that strange feeling of being in no-man’s land – somewhere between vacation and the regular routine that September will bring. It also will bring us a brand new baby BAM. That’s right, First Lady Linda will be lovingly pushing a little boy BAM into the world in August, and as fit and badass as she is, we know she could use some virtual encouragement and support from the #BAMily. So to help us all help Linda, we are thrilled to bring you PUSH IT, push-ups, squats, and core work. For our long-time BAMs, this will bring back memories of those crazy days last winter when we started our 30-day challenges. For our newbies, well, you’re in for a treat. It’s going to be challenging, but nothing like what Linda will be doing, so let’s all jump on this one with renewed energy, and snap out of those doldrums of summer. You can find the link to the program we have chosen here. (As usual, we did not create this challenge. All credit goes to Marc Hemingway, whose terrific blog http://hemingwayrun.com is on the other end of this link. Definitely check out his story in the “about” section.) You will also find a handy-dandy downloadable chart that you can stick on your fridge to remind you to be badass each day. As with all of our challenges, this is scaleable. Don’t be frightened by the number of squats or push-ups or whatever. Do what you can – the idea is to set a realistic goal so you can gradually do more each day. 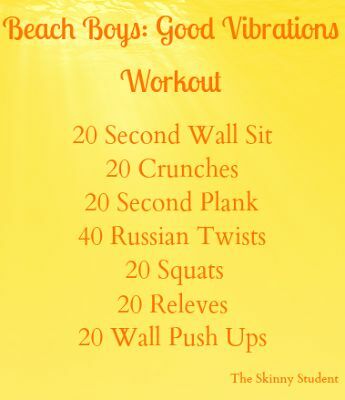 Feel free to spread the workouts throughout the day. It’s much less overwhelming to do three sets of ten than one set of 30. Have a few minutes while waiting for the kettle to boil, the laundry to spin, or the printer to spit out your presentation? Drop and do a set! Tweet us, using the hashtag #PushIt (be careful to use the capital P and I or you may type something you don’t want to! ), and let us know how it’s going. If you’re having trouble staying on it, SHARE WITH US! You’ll get instant support and motivation. BAM @CoachPrawn may even send you a funny distraction. We start August 1st, so we have a few days to get our core strong so we can virtually help Linda puuuuuush it when it’s time. Let’s do this thing and Pu-Pu-Pu-Push It! Push it Real Good! Note: This post originally appeared on Sarah’s sporadically-updated personal blog, but we are re-posting it here because we thought some of you may relate to what she says below. A few weeks ago, I celebrated a significant birthday. 40. The big FOUR-OHHH. Over the hill. Middle age. The 20th anniversary of my 20th birthday. Yep. I am 40. And you know what? I’m fine. I have never really understood women who are cagey about their age or coyly accept another birthday cake labeled “Happy 25th!” long after the joke is over. I’ve decided: I am 40 years old and I’m owning it. As Owner and COO of Sarah Jane Unlimited, and I’d like to be recognized for my 40 years of loyal service. Bring on the gold plated fountain pen. Turning 40 is a strange cultural milestone. For women especially, it has come to signify our inevitable slide toward crinkled decrepitude and undesirability or, if we dare assert our right to remain desirable in some capacity, cougardom. It is creepy and weird. I’m not decrepit (yet) and I’m not a cougar. I’m just me, with a little bit more sense than I had when I first became an adult. So far, the weirdest part has been how others have responded to the news. I have heard a number of variations on “you don’t look 40″ in the last few weeks. Was I supposed to wake up with a hunched back or dentures or something? I think I look 40 and don’t feel terribly discouraged by it. A friend suggested that people say this because they need something to say. It’s just a placeholder in the conversation. I’m sure he is right. But I am intrigued that 40 is the point at which people feel like they need to have a response to finding out your age. Nobody says these things to a 32 year old. Forty is a cultural precipice and I’ve just stepped off the ledge. You could not pay me to be 20 again. The only thing I want from my 20 year old self is to tell her to wear more sunscreen and a hat, and to do the damn knee exercises that the physical therapist recommended. I mean it. I would not trade the beauty of my youth for the wisdom of middle age. I still make poor choices, but not with the naïveté or regularity I once did. No amount of dewy skin and limitless energy beats dodging the freight train of your own stupidity barreling down upon you. It is not that I don’t care how I look anymore (though I do care less), but these days I know better than to compare myself to an airbrushed, made up girl half my age. Or to a celebrity who has a staff of cooks and cleaners and nannies, and access to expensive creams and dermatologists and trainers and plastic surgeons. More importantly, I understand this: what I look like is the least valuable part of me. Time has revealed that people who are smart and funny and caring and loyal will chose to love me and be my friend even if I am small breasted, increasingly crinkly, and not wafer thin. They value who I am, not what I look like. So my energy is better spent working on being a good friend/sister/daughter/mother than looking perfect. Exercise is no longer about how I look, either. It is 98% about how I feel. (I allow myself a 2% margin of error for vanity.) It is about feeling capable–of training for a 13 mile race, of repeatedly carrying two children up the stairs, of not waiting until someone stronger comes along to lift the heavy box for me. It is about my health–keeping my heart and my mind strong enough to withstand the stresses of life and to (hopefully) ensure a long one. Perhaps the most vital shift in my perspective is how I measure my own beauty and worth these days. I think for many of us, the refrain of adolescence, “Am I loved? Am I loved? Am I loved?” echoes on far too long. As a woman, the second chorus is, “Am I beautiful?” When I was younger, what this voice was really asking was “Do THEY think I am beautiful?” The answer to this one matters less to me now too. The great gift of outgrowing the fashion industry’s ideal of coltish, unlined beauty is that I have been freed up to focus on the things that I always suspected mattered more anyway. Do I make and keep good friends? Have I learned to laugh at myself? Do I know how to forgive? Do I know how to ask for forgiveness? Have I learned to stop worrying about the opinions of people who do not matter to me? Have I learned how to speak up when something is important? Have I learned to say no to things? Do I know the difference between stubbornness and tenacity? Have I learned how to choose my battles carefully? Have I mastered the art of keeping my mouth shut? Have I learned that being disappointed over unspoken expectations is my fault for not saying them, not yours for not knowing them? Do I always scoop my dog’s poop, even when nobody is watching? Do I know my children’s needs and fight for them? Do I apologize to my kids when I screw up? Do I give good hugs? Am I a soft place to land? Am I a truth teller? Do I love with abandon? Have I learned to be kind to others (and myself) with no caveats? I’ll admit: It is a long list. I still have so much to work on. But I have time. I’m only 40, after all. First, let me say, thank you for reading this! Whether you’re new or an old hand at this BAM thing, we like to see all the clicks and retweets that help us grow. We also strongly encourage you to click on the FAQs at the top of the page to learn more about who (and why) we are, and what some of our more quirky qualities are. July is a new month, and we First Ladies have to keep on finding new and inspiring ways to keep our BAMs engaged and reaching for their fitness goals. Walk This Way has been a huge success, with more BAMs than ever taking part and getting their booties moving. You’ve walked a few hundred steps or maybe several thousand steps, and we don’t want you to stop that. Ever. Walking is such an incredible way to move your muscles and joints, clear your mind, and boost your metabolism, and now that you’ve started, why stop? In fact, you may not want to stop, even with the launch of our new July challenge. So we’ve created a program full of options for all fitness levels and all types of schedules. You have four choices BAMs. Note that “Do Nothing” is not one of them!!! Option #1: Keep walking. Hashtag #WalkThisWay and let other BAMs know how you’re doing with it, and better yet, how you FEEL. If you’re super new and not sure what our #WalkThisWay program is, click here for the link. If you’re selecting this option because you think it’s easier – we’re on to you (because we ARE you). If this is your choice then commit to it, each and every day, come rain, shine, or bad moods. And if you can, add in a hill or two to boost the challenge! Option #2: Kind to the Core Redux (or K2C2). Those of you who were with us way back when BAM started may remember our December challenge, Kind to the Core (or K2C). It had an element of of being kind to our abs (all the workouts focused on our abs), and an element of being kind to others by donating to a charity (we donated to Leukemia and Lympoma Research, and like to think we inspired other groups to do the same!). 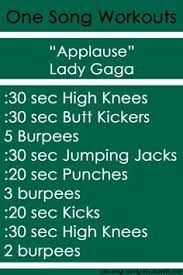 Our revisited version of this involves the Kind to the Core piece with a great ab and cardio workout, and also encourages you to buy a BAM bracelet as part of being Kind to Others. All profits (about $9 a bracelet) go to the Ben Towne Foundation, and you can read more about that if you click here. So far we have donated about $200 to this amazing cause! Hashtag #K2C2 if you choose this option! To access the K2C2 workout, click here. Don’t yell at me because of the B’s in there. This is a group effort, so you have to yell at all three of us. There are YouTube videos for each of the exercises, with low impact versions and versions for those of us who don’t have the cardio level we might want (yet!). The videos are terrific, but the last link to Plank Jacks seems to be broken and just takes you to Running Lunges again. The video for Plank Jacks is here. Finally, on the site there is a calendar that shows each exercise and the times for each. The format is # of seconds to do each exercise / # of seconds to rest in between each exercise. To access the Etsy store to buy a BAM bracelet, click here. Have at ‘er BAMs! Only ten months until BAMapalooza 2016!